For most of you, there certainly is no need to introduce this nature's miracle food. Everyone has coco fever these days!!! Because we love the heat, we bring you an amazing, amazing RAW FERMENTED COCONUT OIL from the tropical Islands of Samoa. All hand-made with love in a sustainable, environmentally gentle family production. While some people falsely accuse coconut oil of being a “fad,” the fact is that it is a traditional oil that has been consumed for thousands of years in tropical cultures, and the research on the health benefits of coconut oil has existed for a very long time. Lauric acid, for example, has a long history of use in combating pathogens, and this research has been around for more than 50 years. Coconut oil is nature’s richest source of lauric acid, an essential saturated fatty acid that enhances the immune system and protects us against viruses, yeast and other pathogens in the gut. A year or so ago, we had some Miami Members help us with taste-test different coconut oils, and this little gem from Samoa came in as a clear winner. Took us a year to have Amos from Miller's Farm and Sally Fallon, the President of the Weston A. Price Foundation, test and let this product and earn their approval and permission to sell on our website. Finally, we are able to offer you this great product in our online store. This is liquid gold - 100% organic fair-trade unaltered fermented COCONUT OIL. Extracted using only the best organic coconuts from the Pacific Island of Samoa, Fuatino's Raw Virgin Coconut Oil is made manually and with love following nature-friendly and sustainable methods. Fermented coconut oil is more potent and easier to absorb than unfermented oil. But regular Coconut Oil is the choice for many of our customers for the sake of the taste and smell. One thing that makes FUATINO’s FERMENTED COCONUT OIL stand out? The absorbent nature of this Raw Virgin Coconut Oil is an indication of how easily it will be digested and absorbed by the body. Further evidence of this is found in its potency. It appears to us that when you are starting off with Coconut Oil, and you begin with Fuatino’s Coconut Oil, your body will react faster if you take too much at once, than if you used a different oil. Are you looking for a coconut oil that is pure, and not hydrogenated? You’ve found one here!!! Every day, we get calls and emails asking for coconut oil that matches the standard that Dr. Mary Newport promotes for the brain care of Alzheimer’s Disease sufferers in particular. All of Fuatino's oils are actually of a superior standard to the jar of “All Natural LouAna Pure Coconut Oil” which was featured in news report about Dr. Newport’s discoveries. Wisdom from ancient times demonstrates the benefits of fermentation. Hormone Balancer – The healthy fats in coconut oil support the thyroid and adrenal glands which can lower cortisol to naturally balance hormones. Coconut oils helps to suppress inflammation, while supporting healthy metabolism, two things that are essential for balanced hormones. The lauric acid, and other compounds support the thyroid and adrenal glands. This helps to lower cortisol, and naturally balance the hormones. Candida Killer – Coconut oil contains caprylic acid which has anti-microbial properties that can kill yeast and candida. Add 1 tablespoon of coconut oil to your diet, and apply pure coconut oil directly to affected areas twice per day, until symptoms resolve. Digestive Support – Coconut oil is easy to digest and contains compounds that destroy bad bacteria, promote growth of probiotics and helps heal leaky gut. Coconut oil promotes the growth of healthy probiotics in the digestive tract. The antibacterial, antifungal, and antimicrobial properties help to control parasites, and fungi, while aiding in the efficient absorption of essential nutrients. Blood Sugar Stabilizer and Diabetes Preventer – Coconut oil can help balance blood sugar levels and has been medically proven to improve diabetes. Constipation Relief – Many people swear by coconut to cure chronic constipation and relieve bloating. Try taking one tablespoon of coconut oil in the morning or before bed in order stay regular. The oil penetrates the digestive track and keeps things running smoothly by killing off harmful bacteria and allowing your gutflora to re-balance. 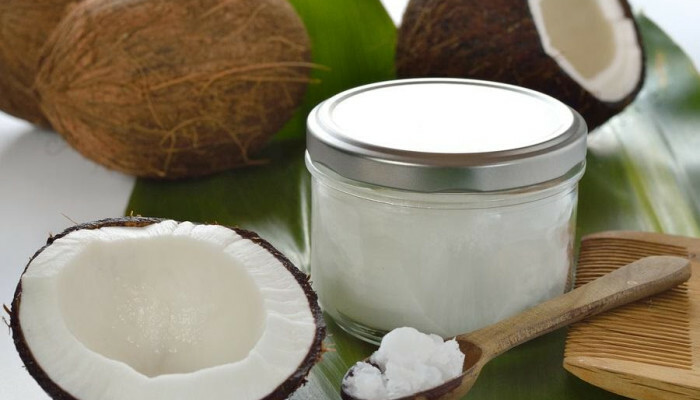 Fight Heart Disease – After decades of coconut oil being vilified due to its saturated fat content, new research is now proving that medium-chain fatty acids and coconut oil are beneficial to heart health and help lower high blood pressure. Sleep Aid – Coconut oil is a perfect carrier oil when making soothing and relaxing home remedies using essential oils, like lavender or roman chamomile oil, that can help reduce anxiety and aid in getting a good night sleep. This product is truly exceptional and blessed by Sally Fallon of WAPF. Now, at last, sold by Miller's Organic Farm @ $16.50 for 17 fl.oz. The little Big Apple has it ALL ! Are you an “Healthy human”, “Superhuman” or a “Ticking Stress Bomb”?